Traditionally, the last airshow of the season once heralded an interminable period of cold, drab weather, with little or no action to sate the appetite of the more dedicated (or obsessed!) enthusiast. The long winter months would see cameras gather dust, as the freezing temperatures kept all but the foolhardiest from frequenting museums or airfields. 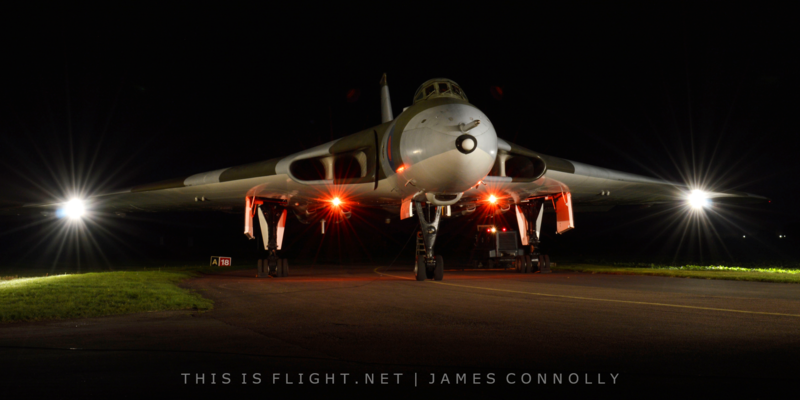 However, it has recently become the vogue for aircraft collections and events organisers to embrace the longer nights, to allow enthusiasts and photographers the opportunity to enjoy aircraft in unique nocturnal settings. While “night shoots” are not a new concept, there has been a recent surge in companies providing such opportunities in Britain at a wide variety of locations: from the pricier Timeline Events, to the “new kids on the block”, Threshold.aero. While such events cater almost exclusively for the photographer, the allure of flood-lit engine runs or the inclusion of period reenactors attract many a paying punter, and rarely do such events fail to sell out. During the winter of 2017, This is Flight sampled three such events, each provided by different organisations, at varying prices – all with differing approaches to the now ubiquitous night shoot. 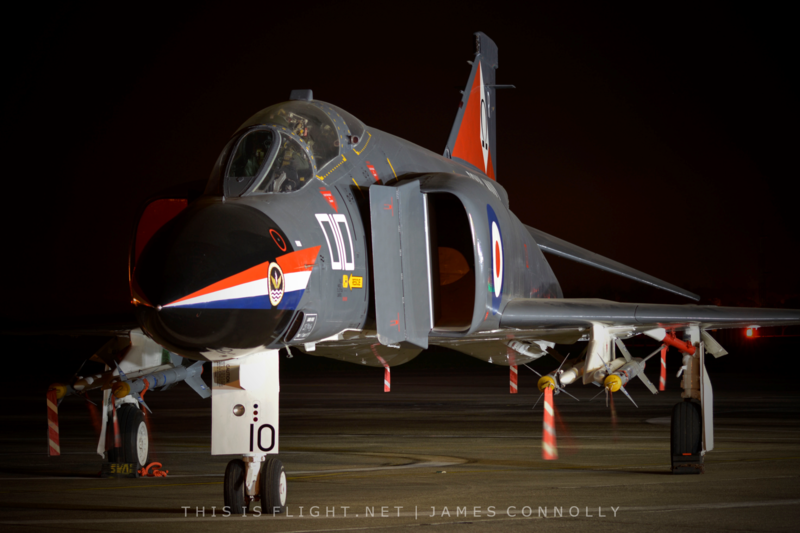 In the early autumn, Threshold.aero held their inaugural Navy Wings Nightshoot at RNAS Yeovilton, which boasted a line-up of various historic naval warbirds and Cold War types from the organisation’s impressive collection of aircraft. The evening presented photographers and enthusiasts alike with a unique opportunity to capture aircraft from the Fly Navy Heritage Trust, and the Royal Navy Historic Flight, both of which fall under the umbrella of the Navy Wings charity. Despite the absence of engine runs, the event did allow for some of the collection’s more elusive items to be brought out from the Navy Wings hangar: most notably the Phantom FGR.1 and Sea Fury FB.11. Upon arrival, visitors were greeted by the majestic sight of six aircraft positioned under the lights, with an additional two Sea Harriers and a Swordfish Mk.II located inside the hangar. 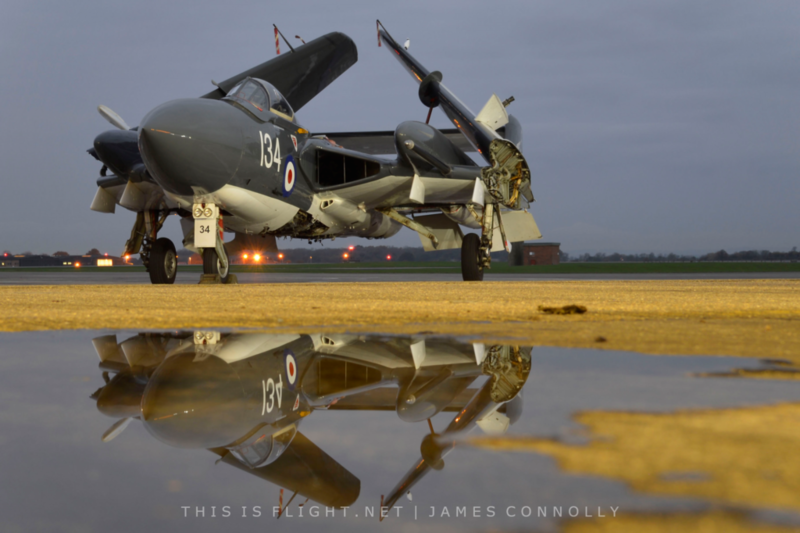 Amongst the participating aircraft, and arguably the star of the evening, was the Fly Navy Heritage Trust’s de Havilland Sea Vixen FAW2, XP924, which appeared resplendent at twilight. 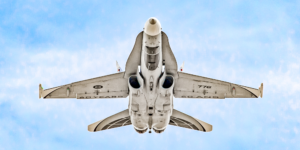 With the aircraft well-positioned, and its wings folded, it was no surprise that the twin-boom classic jet received much attention from the vast number of photographers. Another notable item on display was the collection’s Hawker Sea Fury T.20, however despite a recent return to airworthiness by Weald Aviation Services, following the aircraft’s crash landing at RNAS Culdrose in 2014, it was a shame to not witness VX281’s Centaurus being powered up. Whilst added expenses may have been a limiting factor, it would have been nice to have seen the inclusion of reenactors and/or scissor lifts to provide alternative angles for photographers. While not perfect (the Swordfish Mk.I, for example was poorly lit and badly positioned), the evening was a well organised affair that was conducted in a relaxed and enjoyable atmosphere. Furthermore, without the efforts of Threshold.aero and Navy Wings, both of whom provided welcoming hospitality, the event would not have been able to take place. Later that same week, in a different part of the country, a second nightshoot was held after having been announced more than a year in advance. 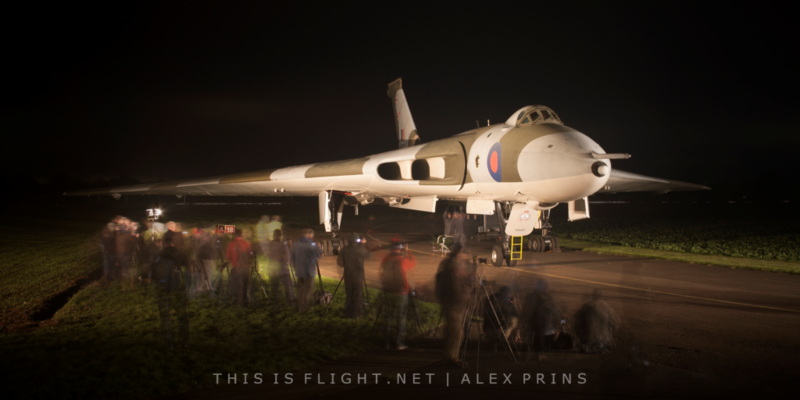 On the 28th of October, Neil Caves’ Timeline Events team returned to Wellesbourne Mountford Airfield to light up one of the enduring icons of the Cold War RAF: Avro Vulcan XM655. Whilst the more notorious XH558 stagnates beside a sewage farm in darkest Doncaster, maintained by paid individuals, ‘655 has been preserved as one of the most complete remaining Vulcans by a team of dedicated volunteers, since its permanent relocation in February 1984. The 655 Maintenance and Preservation Society (655MaPS) maintains the aircraft in a taxiable state, and while it was not possible to witness the aircraft move under its own steam, the evenings’ proceedings were to be concluded by a static engine run and demonstration of the aircraft’s “party tricks”. The event began at 4pm with a briefing by Neil as to the schedule of proceedings, and the various photographic opportunities available; these included two scissor lifts (which were shuffled around to provide a variety of angles) as well as a ‘giraffe’ platform, which provided an incredible elevated perspective of the mighty Vulcan. The briefing was concluded with a short welcoming address by newly-appointed 655MaPS chairman, and ex-Vulcan pilot, Wg. Cdr. (Ret.) Mike Pollitt. 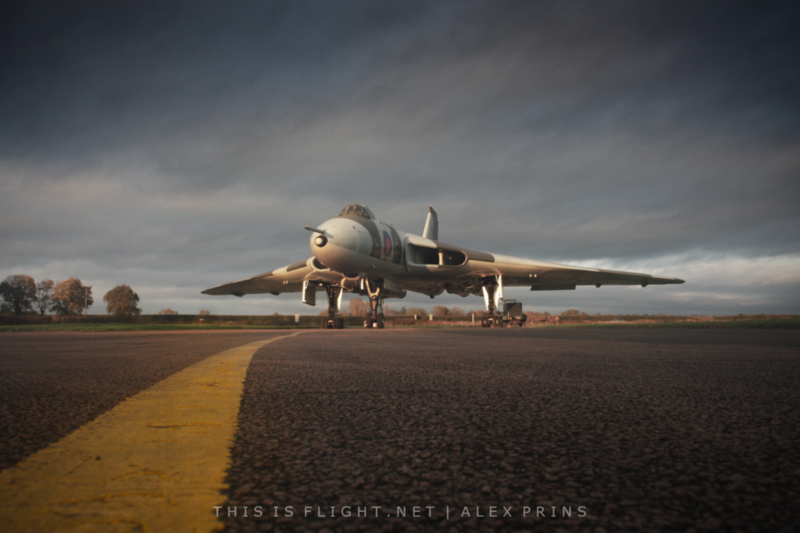 As twilight fell, Neil and his team erected a string of floodlights around the Vulcan, and for the next hour or so the lights were relocated to various distances from the aircraft. Meanwhile, the reenactors carried out mock-maintenance, pretended to arm the aircraft, or simply posed before the assembled photographers. The TLE team did well to coordinate this so that the reenactors stood still long enough for long exposures, and ensure that everyone moved around to allow equal opportunity for all. Indeed, the entire event was extremely well organised, which is thanks to the efforts not only of the TLE team, but also the numerous 655MaPS volunteers who organised the car parks, arranged access to the lifts and steps (a largely thankless job to be stood still on what was a bitingly cold evening), as well as manning their dedicated shop. Finally, the actors were swapped for those qualified to operate the aircraft, and the onboard systems were spun up. For the last half hour, the bomb-bay was opened and closed, the airbrakes were periodically deployed, and the various navigational lights were illuminated intermittently. After four hours of quiet, the wall of noise and light was a shock to the senses, but it proved to be an entertaining conclusion to the event. It must be said that the event was pricey: at £60 per person for a 4 ½ hour event, which was to be paid more than 12 months in advance (a difficult commitment for some to make). 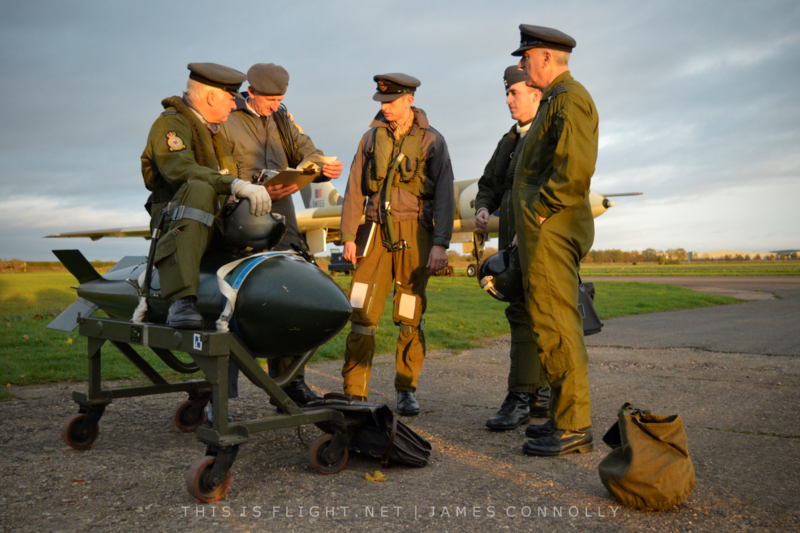 However, for that price we gained unique access to photograph the aircraft, we benefitted from reenactors to complement the scene, as well as being privileged to witness a full systems run at night. Much has been said online in some quarters about the price that TLE charges, however for such rare opportunities, sometimes it is simply be a case of coughing up – each individual must decide whether they feel the event would warrant the costs: it is a simple choice not to attend if the price is disagreeable. With two TIF reporters present, both thoroughly enjoyed the event as a one-off, however the cost would likely prohibit a return. 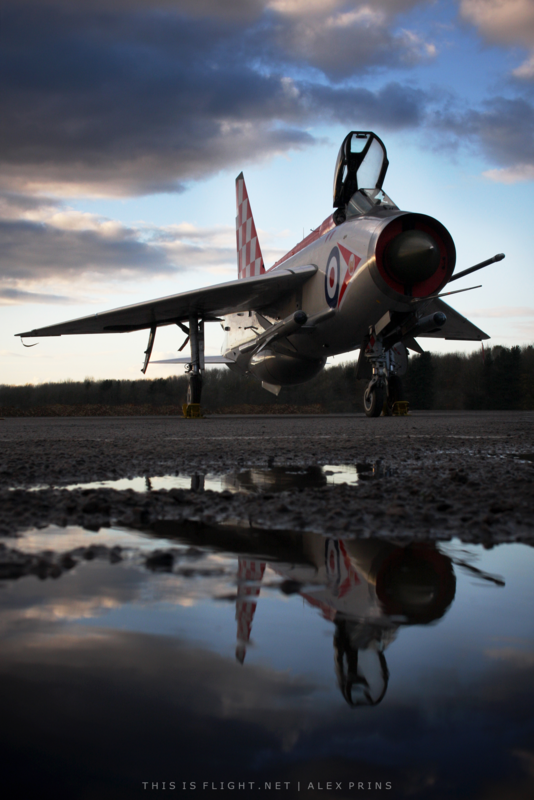 Finally, a week after having sampled the services of Timeline Events, This is Flight returned to the Midlands for an independently hosted event at Bruntingthorpe, with the Lightning Preservation Group. 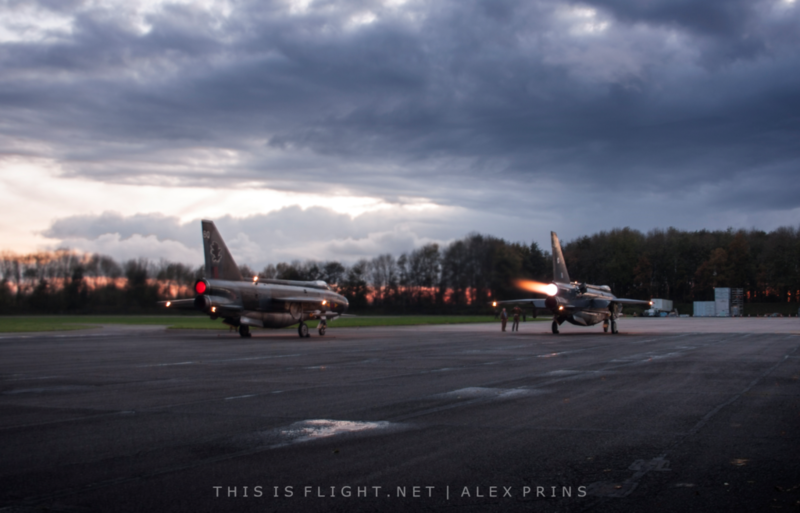 The LPG opens its gates twice annually to host a “twilight rolling reheat” event, as their two live English Electric Lightning F.6s are scrambled as though to intercept a marauding Soviet aircraft during the height of the Cold War. As the gates opened early in the afternoon, however, visitors were welcomed onto an unrecognisable Bruntingthrope Aerodrome. The runway threshold was a construction site, with much of it being dug up, while most of the available runway and hardstanding space (and much of the grass) was crammed with many thousands of cars. This was unsurprising, considering that there was no ‘Cold War Jets’ day at the airfield in 2017, as the site currently earns its keep as a vehicle storage facility. Therefore, the scramble would not take place from the authentic QRA sheds that shelter the Lightnings, but from the opposite end of the runway, some 3km away! Before the event officially began, visitors were allowed limited access to many of the resident aircraft, however the confined space and oppressive presence of so many cars, precluded many photogenic compositions. The early star of the show was the ‘dual identity’ Lightning F.3, XR713/XR718, whose port side is adorned in the colours of 111 Squadron the Tremblers, while the starboard side was recently unveiled as having been repainted in the colours of 56 Squadron the Firebirds. 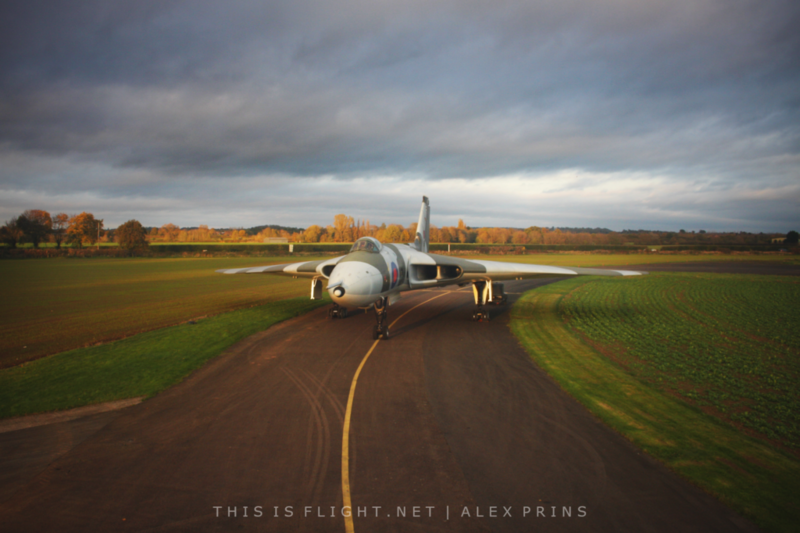 The aircraft itself is the newest addition to the LPG, having been relocated to Bruntingthorpe from RAF Leuchars in Scotland, and in spring 2017 the aircraft was partially repainted in a joint venture by the LPG and the Centre of Aviation Photography. 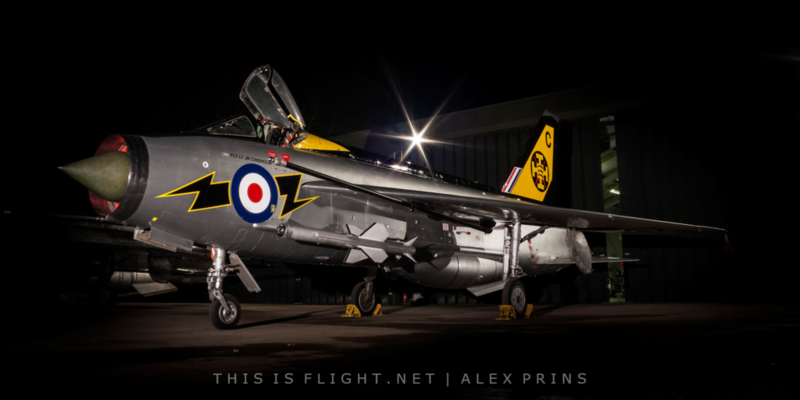 November’s photoshoot was, therefore, the first opportunity to photograph the aircraft under the lights. Shortly before the QRA scramble was to commence, the two “live” F.6s were towed to the far end of the aerodrome, while the assembled throng was transported the length of the runway on board two buses (each shuttling at least two loads). This meant that many of those present were forced to wait for a prolonged period, as the crowd of several hundred visitors was relocated. The new orientation also meant that for the most part, the action would also be taking place with the setting sun out of view, hidden behind a treeline. Eventually, once everyone was ready, an airhorn was sounded to scramble the two aircraft. 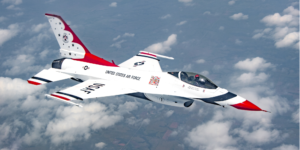 Within seconds, the two pilots had entered the aircraft and ignited the engines. Then, as the canopies closed, the first Lightning blasted down the runway, closely followed by its wingman moments later. The two aircraft shot past with both afterburners lit, just metres from the crowdline, and disappeared within seconds beyond a crest in the runway. Silence descended once more, as those assembled recovered from the sudden assault on their eardrums, before a dull roar heralded the Lightnings’ return. The pair taxied back somewhat more sedately than moments earlier, before being chocked, once more almost within touching distance of the spectators. 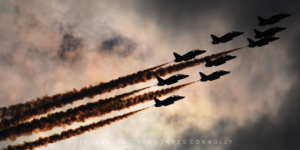 Each aircraft then carried out a synchronised static engine run, with each afterburner being lit in turn; even while wearing earplugs this wall of noise was overwhelming, as the air was torn apart by four Rolls-Royce Avons in full song. After almost 2 full minutes of oppressive noise and heat, the two aircraft turned once more and slowly rumbled back from whence they came. Here the format of the evening came a little unstuck, as several hundred visitors had to be quickly transported back to the Q-sheds for the nightshoot itself. Whereas the journey out had been leisurely (as the runs would not proceed until all were assembled) the return trip was more significant, as those on later busses lost out on vital time photographing the aircraft under the lights. That being said, even the last bus-load had a fair amount of time to explore different angles and compositions. Centred around Q-shed hangars that once hosted RAF aircraft on alert during the Cold War, an authentic scene was created, with a suitably dressed reenactor posing beside XR713/XR718 within one side of the shed, while F.6 XS904 was positioned outside the closed doors of the other. In a conscious decision to cater for all photographers’ wishes, XR728 was positioned away from the hangars in near-complete darkness to allow for various alternative long exposures. The photoshoot continued for another half hour or so, before the bright Q-shed lights were brought back on and the aircraft were put to bed. With a more reasonable price of £25, and the inclusion of a double reheat fast-taxi, it comes as no surprise that the number of visitors was greater. There was also a wider variety of ages and interests present, from the serious photographer with top-of-the-range gear, to the younger children simply there to enjoy the event and perhaps snap a few mobile phones pictures. While the shuttlebus situation was far from ideal, the airfield is clearly earning its keep as storage in order to secure a long-term future for the collection of aircraft, and airfield owner Dave Walton was visible throughout the evening coordinating the buses and ensuring that the event ran smoothly. The friendly atmosphere, perhaps a result of the decreased price encouraging more than just die-hard photographers, made the event extremely enjoyable, and the addictive sensation of being shaken by four afterburning Avons is more than enough to encourage a return before too long! 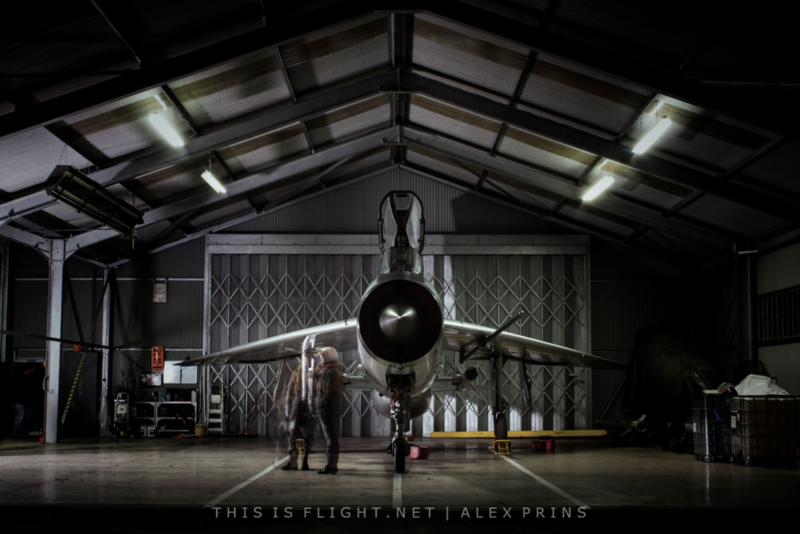 Alex Prins is a UK based photographer and aviation enthusiast, and also the deputy-editor of This is Flight. James Connolly is a student and aviation enthusiast whose future ambitions lie in journalism. He is based in the UK and attends several airshows each year.